Yesterday I mentioned how we could use the motion of hydrogen gas in our galaxy to determine the distribution of mass in our galaxy. Since that calculation on is based on gravity, what we really measure is the total amount of gravitational mass there is in our galaxy. When we do this we find something very strange: our galaxy (and other galaxies) have more mass than they should. There are other ways we can measure the amount of matter in our galaxy. In particular we can measure the amount of stars, gas and dust we can see, which gives us a good estimate. However when we do that we find the mass we measure gravitationally is much higher than the directly observed mass. If we subtract the observed mass from the total gravitational mass, what we have is a different kind of mass. A dark, unseen kind known as dark matter. 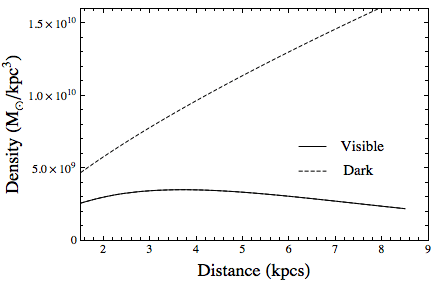 In the figure below I’ve plotted a comparison of the the amount of regular visible matter vs the amount of dark matter in our galaxy. We’re not yet sure what dark matter is, though we have some ideas. 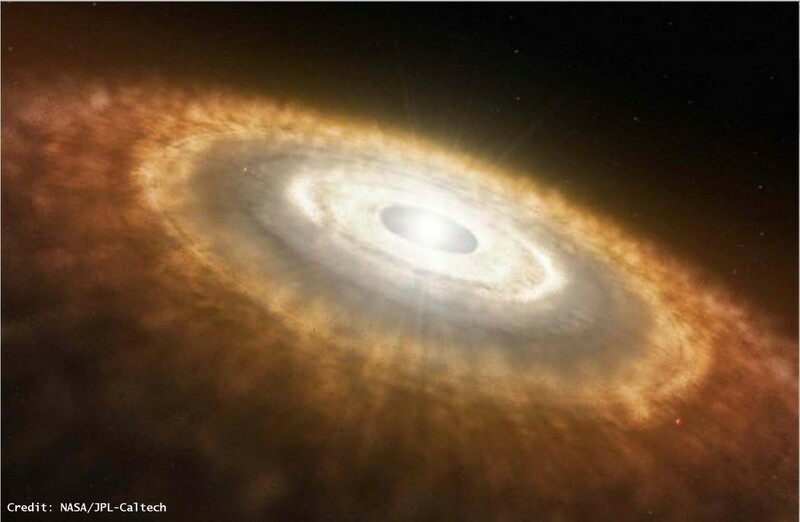 What we do know is that it has gravitational mass and it is not any kind of regular matter such as gas, dust, planets or stars. Dark matter is something different, and there is about four times more dark matter than regular matter in the universe. What dark matter actually is remains to be seen.